Size: 13" x 11" x 1"
Showcasing the outstanding craftsmanship of our artisans through this bold black shoulder bag. 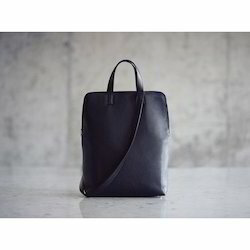 Made with qualitative material, this stylish and chic bag is beautified with glossy bag fur near the zipper. It is more like a high-function accessory than a handbag because it adds such a fun bright energy to anything we wear as a cross body bag, whether casual or elegant. The orange strip around it and veg leather have the ideal detailing for this spring and summer. Single handle shoulder bag with top zipper closure, metal zippered pocket and I PHONE holding slip pocket. 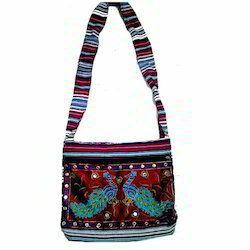 We are engaged in designing and supplying Ladies Shoulder Handbag, designed with utmost consideration. We have brought forward our offerings as per the prevailing market trends and thus, assure our customers products, which will add style & elegance to their look. These bags are available in bulk at reasonable rates.